Eli Manning is an American professional football player. He is an NFL quarterback, and plays for the New York Giants. He was voted MVP for Super Bowl XLII (2008) and XLVI (2012). 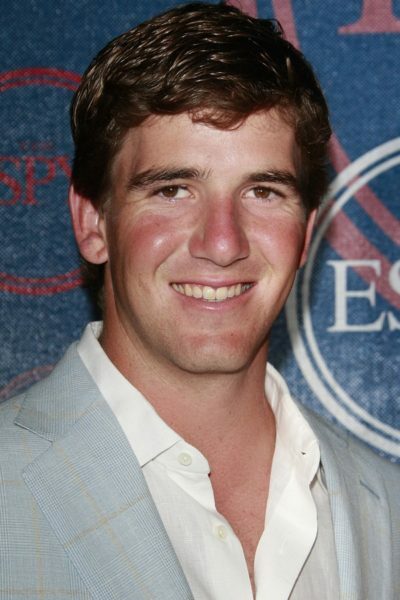 Eli is the son of Olivia (Williams) and Archie Manning (Elisha Archibald Manning). His father was also a professional football player, as is his brother, Peyton Manning. He is married to Abby McGrew, with whom he has three children. Eli’s Elisha Archibald Manning (the son of Archibald Elisha Manning and Annie Sophia Gaddy). Eli’s grandfather Elisha was born in Mississippi. Peyton’s great-grandfather Archibald was the son of Richard Elam Manning and Elizabeth Ann Pevey. Peyton’s great-grandmother Annie was the daughter of John Columbus Gaddy and Virginia “Jenny” Johnson. Eli’s paternal grandmother was Jane Elizabeth Nelson (the daughter of Joseph Lafayette Nelson and Olivia Beady/Bready). Jane was born in Tennessee. Olivia was the daughter of Isaac Newton Bready and Bettie M. Nowlin. Eli’s maternal grandfather was Amzie Cooper Williams (the son of Amzie Jackson Williams and Nannie Mae Stribling). Eli’s grandfather Amzie was born in Mississippi. Nannie was the daughter of John Nathaniel Stribling and Virginia Lee Lang. Eli’s maternal grandmother was Frances Irene Thomas (the daughter of John James Seale Thomas and Mary Bell Warren). Frances was born in Mississippi. John was the son of Abraham Elijah Thomas and Virginia Eveline Seale. Mary Bell was the daughter of William Moses Warren and Clara Swan Hamilton.